Our automatic almond oil press is an integrated oil press machine which includes heating, expelling and filtering in one machine, and is capable of controlling the processing temperature automatically as well as both cold and hot extrusion. The almond oil press can be also used to extract various vegetable oil from other oil seed like peanuts, rapeseeds, soya beans, seasameseeds, palm-seeds and seeds of sunflowers, cottonseeds, tea seeds and tung tree seeds, coconut and olives palmseeds as well as rice brans etc. 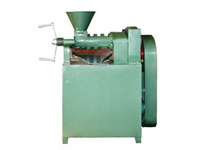 Our almond oil press is equipped with automatic temperature rising and oil-cleaning system. It can be used both as cold press and hot press. The design of the automatic oil press is novel and performance is perfect, and as it requires low investment and generates high profit, so the machine covering small space, performing perfectly, and its easy-to-operate. Our automatic almond oil press is quite suitable for those who do business in the country market or who run a small scale oil mill plant. 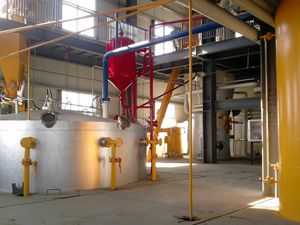 People could see the whole process of oil pressing, they believe it’s clean and reliable. It includes motor, vacuum, filter, heater and electric control cabinet. 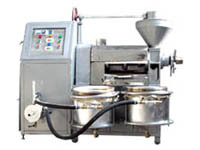 The assistant part can help the oil presses with higher output. The function of the vacuum oil filter used to filtrate the crude oil which come out from oil press. They are an ideal choice for customers. Whenever you are interested with our automatic almond oil press, or you want to purchase oil press machine to process other oil bearing materials, please don't hesitate to contact us. we are always ready to solve your problem!